ecochick: Filter for Good: A Campaign To Reduce Water Bottle Waste. And a giveaway! "We're going to get stainless water bottles for each family member...no more plastic! "Sarah said...I have also been using a Brita forever, in fact, it might be time to replace it :-) I always drink tap water and I like how the Brita seems to minimize the chlorinated taste of Ottawa water." You're each getting Brita pitchers! It has been estimated that it takes three litres of water to produce one litre of bottled water. Worldwide, it takes an estimated 2.4 million metric tonnes of plastic to bottle water each year. The price we pay per litre of bottled water is comparable to the price of gasoline. All this, when if we merely turn on our taps, we have abundant, clean water available for pennies. It's time to change our habits. The popularity of bottled water is, to be blunt, the biggest crock in the world, the most amazing snake oil ever sold, the most enormous triumph of marketing over common sense. There are so many reasons not to use bottled water - the price, the environmental impact, the sheer lunacy. But many people persist, because of the convenience or perhaps the belief that bottled water "tastes" better (despite the fact that some common bottled water brands are nothing more than municipal tap water). Learn more about the issue at Filter For Good. Realize that our bottled water habit is killing us. And consider changing your ways - by, for example, bringing your own water. Don't like the taste straight from the tap? Easy. Just go pick up a Brita filter, which will filter over 900 litres of water a year - the equivalent of 1,800+ 500 ml plastic bottles. Learn about their filter recycling program. And, if you're in Toronto, you can go down to Yonge-Dundas Square on April 22nd from 11am - 7:30 pm to hang out, play games, hydrate, watch David Usher, and take home a free Brita pitcher from Filter For Good while supplies last. Nice! Not in Toronto? Pity. 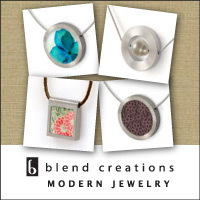 Then you'll just have to sign up for the giveaway here on ecochick. 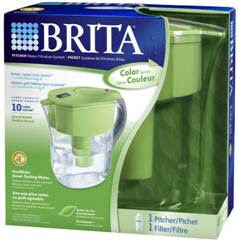 I have two of Brita's Limited Edition Green Pitchers to give away to you, dear readers. Just head on over to the Filter for Good website and tell me how you plan to change the way you drink water. Leave a comment by Wednesday, April 28 and don't forget to leave me your email addy as the recipients will be notified by e-mail. Canadian addresses only please. Good luck! I always carry a reusable water bottle and filter our water. Whenever bottled water in an option I always request tap. I use filter my water as well and use reusable bottles. At restaurants, I make a point of saying I don't drink bottled water and ask for tap. I have a reusable Rubbermaid water bottle I take with me in the car, to the pool, to bed, etc. I also either request tap water in a restaurant or if I know I won't be drinking any water, I request that they do not bring any (as some places automatically bring water to the table). Unfortunately, I love mineral water and since there isn't a tap option for this, I make sure the restaurant recycles or I bring the empty bottle home with me to recycle (and these are usually glass bottles and not plastic). I have a few reusable bottles that I use regularly. Any glasses of water that don't get finished go out to water the plants and flowers. Our tap water doesn't taste very good, so I curious to try the Brita to see what the taste difference is! I've been using a Brita for many, many years. When we're on the go, we bring our own reusable containers to avoid buying bottled water. I always have a refillable water bottle with me (no plastic here!) and religiously use a brita! I always drink tap water but I miss it being really cold so I would love to try a Brtia! I always use a reusable bottle, but on our last move our Brita got destroyed, and somehow it never got replaced. I'd love a new fancy green one so I can get filterin' again! I have also been using a Brita forever, in fact, it might be time to replace it :-) I always drink tap water and I like how the Brita seems to minimize the chlorinated taste of Ottawa water. We keep a glass pitcher in the fridge so the water is nice and cold, and we each have a refillable bottle to bring with us when we are out. I think a Brita would be a great replacement for the current pitcher! We're going to get stainless water bottles for each family member...no more plastic! I wasn't able to get down to the giveaway...and really, I couldn't excuse driving downtown to pick up something ecological...thanks for the giveaway! We have been staying away from water bottles and keeping our own, but we haven't been filtering it. This would help! I refuse to buy bottle water, and keep a few reusable water containers in the house. I even commented to my daughter when she bought a case of water yesterday that she should have a reusable container to take back and forth to the gym with her. I prefer tap water over bottled water but would love to try a Brita to keep my water cold in the fridge. This might help me drink more water than other bottled drinks as well. We almost NEVER drink bottled water. With three little kids in tow, having something to drink on hand is a must, so we bring tap water from home. We use reusable containers as well, and I have to admit that Ive never used or owned a Brita, and would really like to! I find hope in the fact that non-profit orgs like UNICEF, Greenpeace and Safe Drinking Water Alliance are making a difference for developing countries that are without safe drinking water. Projects such as desalination perth have benefited much of Africa. I prefer water filtering system too than using bottled water. Not only you can help the environment is using them, it's also for long term use.